Beetles. Stop them! is the name of the game and exactly what you will be saying as you are rapidly smashing them on your iPad screen. Beetles. Stop them! was developed by Pavel Vladimirov, and your job is to survive as many waves as possible by smashing beetles. 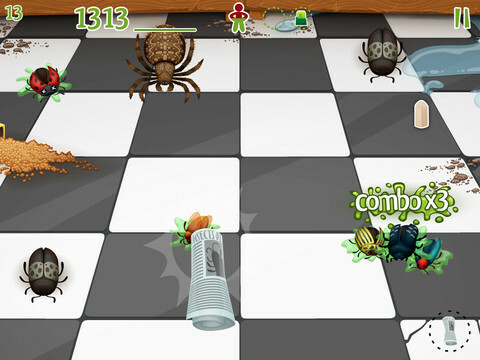 Tons of beetles will be rushing to the bottom of your screen. Smash them before the reach the bottom and you will earn points. If they reach the bottom your health will decrease and the game will end when you have no more health. You will have to watch out for the good beetles and not smash them and you will also have to watch out for the boss beetles who will be harder to kill. Throughout the game you will have options to pick up super weapons and regain your health, and if you do not want to wait for items, you can unlock them through in-app purchases from their store. This game is very fun and enjoyable but can be a bit difficult. It is a game that kids of all ages can play, but it may be a bit too challenging for the younger kids, and there is no difficulty levels that you can adjust. Currently this game is priced at $0.99 and is available on the Apple App Store. Go check it out!